Mooloolah Valley is a small town on the Sunshine Coast hinterland, Queensland, Australia. At the 2016 Australian Census Mooloolah Valley recorded a population of 3,321. It is situated north of Landsborough on the main railway line from Brisbane with regular services southbound to Brisbane and northbound to Nambour and Gympie from Mooloolah railway station. The Mooloolah River forms part of the eastern boundary. Mooloolah is referred to as Mooloolah Valley to distinguish it from the nearby Mooloolaba. 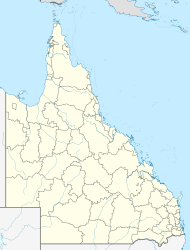 Mooloolah is under the postcode 4553, and is in the Federal Electoral area of Fisher. The Sunshine Coast Regional Council operates a mobile library service which visits Bray Road. Mooloolah has a number of heritage-listed sites, including the Dularcha Railway Tunnel, 1.5 km south of Mooloolah township. ^ a b Australian Bureau of Statistics (27 June 2017). "Mooloolah Valley (State Suburb)". 2016 Census QuickStats. Retrieved 25 March 2018. ^ "Dularcha Railway Tunnel (entry 601522)". Queensland Heritage Register. Queensland Heritage Council. Retrieved 14 July 2013. ^ "Ewen Maddock House Site" (PDF). Sunshine Coast Region Heritage Register. Sunshine Coast Regional Council. Retrieved 20 April 2019.